The beginning of „Stronghold“ goes back to the late 90`s with a bandproject that never really worked out, so it was canceled very fast. 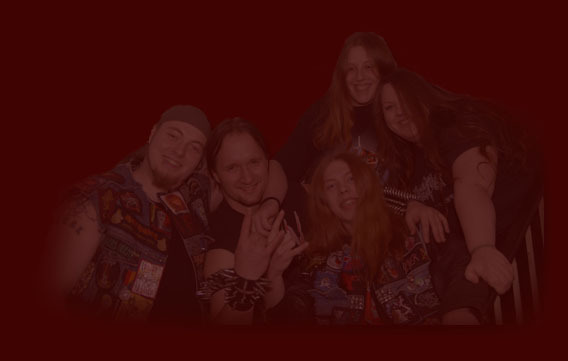 A few years later, in January 2004, there were a few Metalheadz, meeting in their local (it was not that difficult because of the low number of visitors there) and they decided to fight against the lack of Heavy Metal in their homearea! At this time the band exitsed of Gordon Overkill (Guitar and Vocals), Sally Steel (Flute, Viola, Cello, Keyboards), Klinger (Guitar), Junior (Drums) and Nick Demon (Bass Guitar). After thinking a lot about the bandname and some beer Gordon got the name “Stronghold” back in his mind and everybody thought this name is great! Stronghold is a appropriate metaphor for the mighty, epic metal the band plays. The band logo arised at the same evening, when the decision for the bandname was made and Sally did some art with a high alcohol level! But Nick, who played in the band because he is a good friend, had no musical talent at all and he (and the others aswell) recognised that there´s no way for him to play the bass. So everybody decided to make him “The Battleaxe Man” for live shows (that´s what he really can do very well!). Because of this it comes that Danny D. Sire, former bandgroupie and Sallys best friend, joined the band, even if she didn´t play the bass guitar before too. But it transpired that this was a good decision, because she did her job very well. A little while later Gordon decided to give up his “carreer” as a vocalist and Stephan, a good friend again, was “Strongholds” new man on the micro! Now the band could start! But as it happen so often fate wasn´t with them. One week before Stronghold could start the recordings the guitarist Klinger left the band for personal reasons. That was a very pitty and tearful thing, because he wasn´t just a founding member, but a very good friend aswell, what never changed until present. He was replaced by Dynamaik, who raised the soli and melodys in new dimensions! Because of this upswing the band was ready for stage very fast. Live set was ready, but different producer problems resulted in not releasing songs. At the same time Stronghold got to know that there is another band called Stronghold aswell, and that's why the band decided to change our name into Strongholde, with the medieval "e" at the end. In late 2005 and early 2006 Strongholde played their first live shows, wich were quite a success. Nevertheless the band was forced to take another hard step. More and more it became obvious that Pancor Jackhammer wasn´t the right voice for Strongholde. While he found his musical appointment in the Black Metal Band "Graupel", Gordon returned to the place behind the micro. In February 2006 Stongholde played their biggest gig to date; they interlude Thee Plague of Gentlemen and Pentacle. Due this show the band introduced the new singer Blacky, who joined until December 2006. In spring 2006 Strongholde met Stefan Finger and they decided that this nice guy will be the producer of Strongholdes first Demo EP. Because of some time problems it lasted very long to finish this recording, but finally in January 2007 the band did it! For pitty Blacky had to leave Strongholde because of personal differences, so Gordon was again the man behind the mic, with the support of Sally. In this constellation the band released their demo "Heavy Metal is back from hell" on March the 3rd 2007.